Tooth loss can significantly impact your day to day life. Whether you’ve lost just one tooth or a full row of teeth, the Marble Dental Care team is here to help put the smile back on your face. In our state-of-the-art dental office in McKinney, we offer a wide range of tooth replacement options from fixed bridges and dentures to complex dental implant supported prosthetics. When you’re ready to get started putting the smile back on your face, give our team a call today. We’ll schedule a tooth-replacement consultation appointment to review your options and partner with you to create a restoration plan that will deliver a picture-perfect smile you’ll be proud to share. 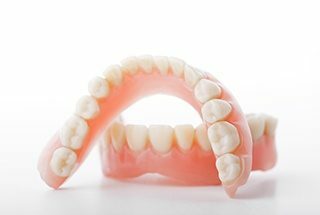 Partial dentures are tooth replacement prosthetics used to fill the gaps in your smile following the loss of multiple consecutive and nonconsecutive missing teeth. A gum colored base is molded to fit between remaining teeth. Then, the replacement teeth are attached to the base material seamlessly closing the gaps in your smile. The entire prosthetic is anchored to surrounding healthy teeth with clasps. If you’ve lost one or both full rows of teeth, a full set of dentures can, quite literally, put the smile back on your face. 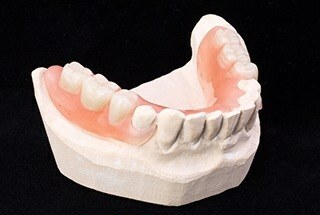 Because there are no remaining teeth to offer support, full dentures need to be crafted to fit against the gums. When fitted correctly, the base of your denture will create suction with the gum line that holds the denture in place. While traditional removable dentures replace the parts of your teeth that are visible above the gum line, they leave out the very important supportive tooth root structure. For added stability and longevity, dental implants can be used to replace the tooth roots and support your partial or full denture. Don’t start out wearing your partial or full denture all day every day. Instead, wear the dentures for a few hours at a time to get used to them. Try reciting tongue twisters and singing with your denture in place to get used to speaking clearly and build your confidence to communicate in any situation. Test the limits of your denture when eating meals, but don’t overdo it Start out with soft foods and gradually introduce more difficult to chew meals. Take care of your denture as well as any healthy remaining teeth. Take your dentures out before you go to bed. Brush them carefully and store them overnight in a container of water or denture cleaning fluid. If you have remaining natural teeth, continue to brush and floss these. If you don’t have remaining teeth, you can gently brush your gum tissue and/or use antimicrobial mouth rinse to prevent plaque buildup on your soft tissue.